Cool Dog Names for Boys! Want great puppy names? We can help you. You'll find hundreds of cool dog names for boys in our comprehensive database of cute puppy names. Why not scroll down and take a peek? We don't bite! Too eager to read further? Skip straight to our list of cool puppy names for male dogs. ﻿You might be wondering though, what exactly is a cool name for a Cocker Spaniel? Well, a cool puppy name is something different or trendy; something that will give your little boy the 'street cred' he really deserves! Our dog's names can reflect their personality and character and if your Cocker Spaniel puppy is cool (which I'm sure he is!) you'll probably want to choose a name for him that's equally cool and matches him just perfectly. To help you do this, I recommend you read my tips below on how to choose your ideal puppy name. Pick a name with only one or two syllables, not only will this make it much easier for you to say, your Cocker Spaniel will begin to recognize his name much earlier too. And as an added bonus, a shorter name will make it much easier and quicker to train him. Also, try to pick a name that the whole family can agree on and don't forget, you'll be using his name quite often and calling him to you when you're outdoors, so make sure you choose a name that you and your family are comfortable using when others are around! 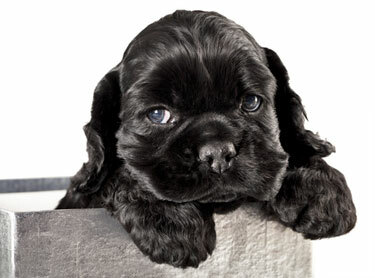 You'll find many more tips and suggestions on choosing your puppy's name to help you get the best out of our database. Here's a good selection of cool dog names (below) to help you get started. Good luck, and I hope you find exactly what you're looking for!